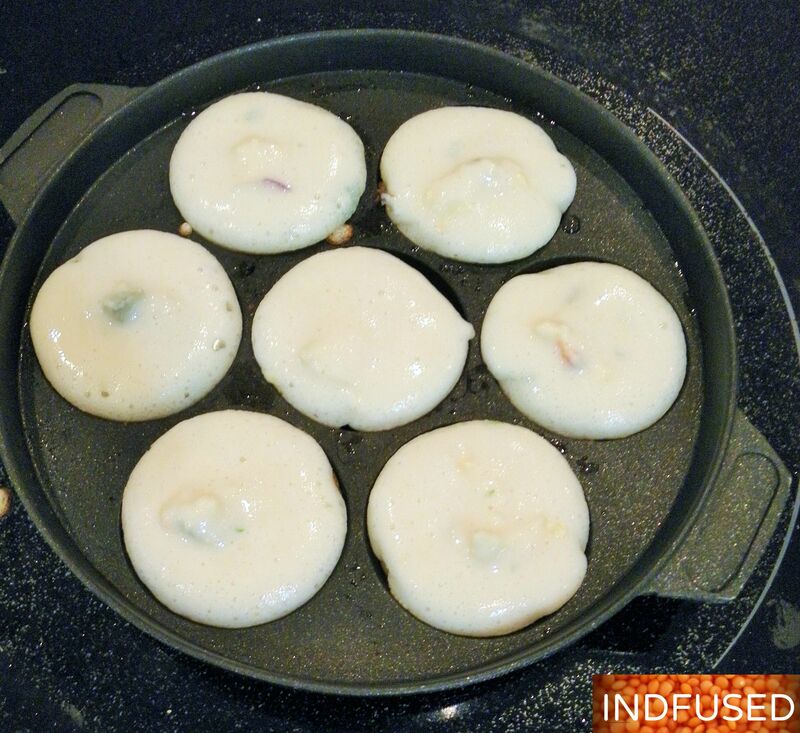 I made two types- one using plain dosa batter and to another batch of the same batter, I added finely diced onion, jalapenos and grated ginger. The yummy cheesy stuffing is a mix of pickled jalapenos, light veggie cream cheese and cheddar cheese, just combined together. 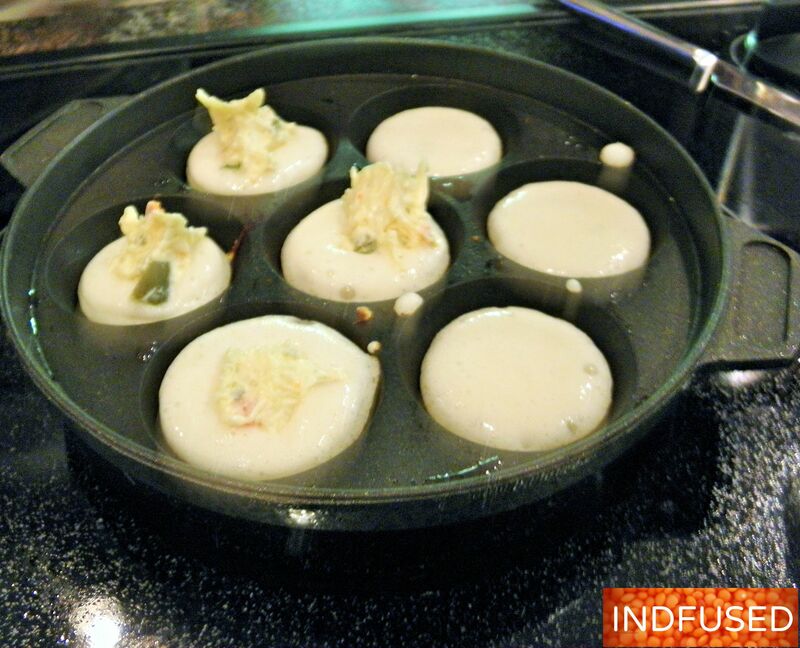 To make them, in each of the indentations in the aappe pan I add a drop or two of oil or spray it with cooking spray. I use olive oil in the Misto spray can. I pour some batter in each, top with the cream cheese jalapeno mixture in the center, and cover it with some more batter. That easy! I cover the pan and let it cook on medium heat, about 2 to 3 minutes on each side. Crisp on the outside, fluffy inside and ooh so cheesy in the center! Do try this quick and easy, healthiah, Jalapeno Poppah Aappah! To the dosa batter, add salt, if needed. If making the spiced batter, add the diced onion, jalapenos and grated ginger too. Heat the appe pan on medium heat. Drizzle a couple of drops in each indentation or spray with oil. Add batter to each indentation until it is half full. Top with the cream cheese mixture. Add more batter on top, to cover the filling. Cover and let it cook for about 2 to 3 minutes. Remove cover, lightly brush aape with oil and turn them in the pan. Cook for another 2 minutes or so. Come and get it! Crispy on the outside, fluffy inside with a cheesy center. Remove from pan and serve with quick chutney or with the store bought green chutney. Enjoy! Wow amazing!! This looks fantstic! they are wow amazing! I honestly wish I could try this Sandhya!! Judy, hope your nephew likes them. I am fascinated by different names of the aape pan …wonder about the history. Thanks to our blogger friends, I am finding so many similarities in names of different foods too. Oh my goodness, this looks so yum!! Sonal, Thank you! Let me know how you like it. I love jalapeño poppers too, and I can’t wait to make this! It didn’t occur to me to fill these with cheese. Thanks Aruna. I was happy that my children, who normally are not aape fans, also loved this cheesy version:) and I love the pickled jalapenos too. Hehe, I love the names of these goodies!! How fun 😀 And I can imagine how good they taste! 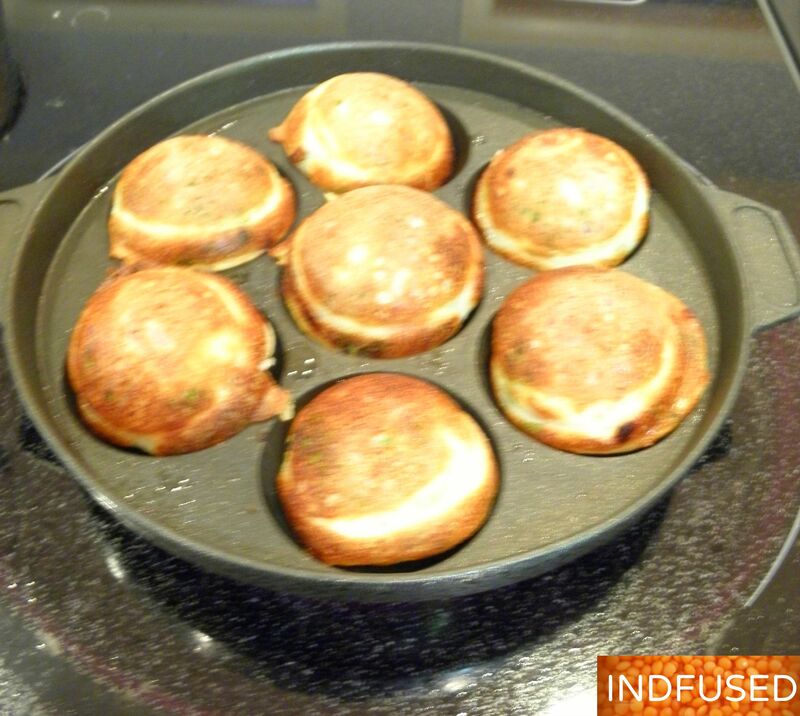 Another recipe for my æbleskiver pan, thank you!!! Thanks Naina! My tribute to the city I live close to for so many years now! Ah-maze-zing! Look at that gooey cheesy center! YUM! 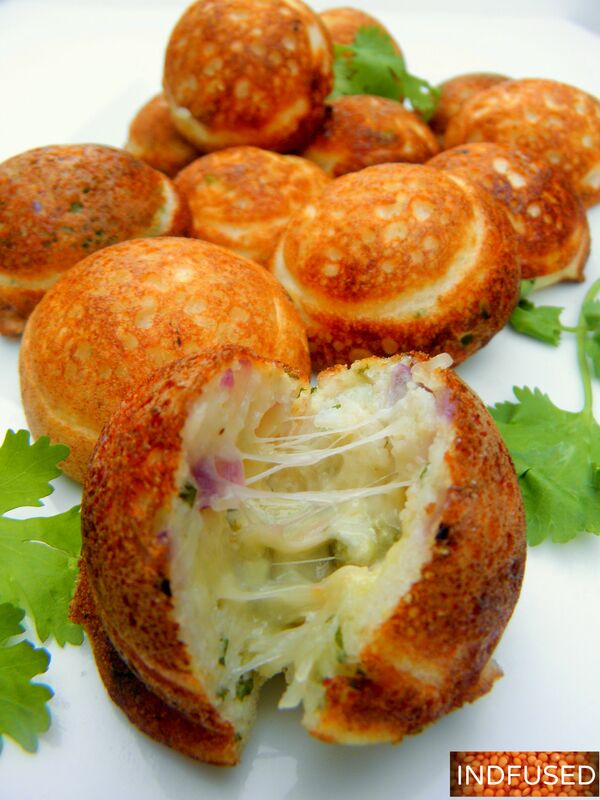 These sound and look so great (especially with that cheesey filling). The aape pan must be so useful because you only need to use a bit of oil…and now I’m thinking about all the other things that can be done in it like abelskiver and takoyaki too! Yes I am going nuts using the pan for so many things. It is fascinating how different cultures have been using the pan, with different names. Loved the recipe. I am definitely going to try this. Thanks sandhya for a great idea. i am so glad you liked it! It was a hit with the children too! Now this is amazing fusion food. You outdid yourself with this dish Sandhya. Excellent idea. Thank you so much Ana! Truly grateful for your inspiring words! Thanks Barbara! I love to cook on the grill. the flavor is so unique, right? Will definitely try that. Thanks again! Oh my heavens! I could eat these as a meal. They look amazing, and would dress up any appetizer table! Oh Stephy! You made my day! Thank you so much ! Btw,you have a great blog! Thanks for answering my question Sandhya! 🙂 I’ll try looking in our Asian grocers to see if they stock the pan. I did nominate you for the Liebster Award. I love your authentic recipes and the colorful blog! Thank you so much for thinking of me. I really appreciate your kind words about my blog too. Can I make this in oven using cupcake pan? Ronit, I made these again after a long time too. The children love them too and they were perfect for the cool ,rainy weather we are having. Wow Sandhya! I love jalapeno peppers and cheese. This looks amazing! Thank you Antonia for your kind words!